Inspired by the best-selling book The Map as Art, this exhibition presents large-scale artworks that explore issues of mapping—whether conceptually or quite literally—while also examining the personal gesture involved in works of overwhelming size. The exhibition is co-curated by Kemper Museum Chief Curator Barbara O'Brien and Katharine Harmon, author of The Map as Art (published by Princeton Architectural Press, 2009). It features work by DC Moore Gallery artist Joyce Kozloff. 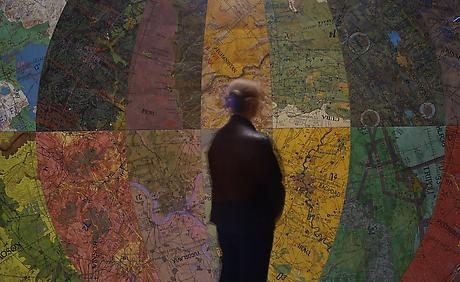 Joyce Kozloff, Targets, 2000; acrylic on canvas with wood frame, 108 inches diameter; Courtesy of the artist and DC Moore Gallery, New York; photo: Jon and Anne Abbott, courtesy of DC Moore Gallery, New York.